October 14, 2016, WAKEFIELD –As stewards of the state’s waters under the Public Trust Doctrine, all Rhode Islanders have the responsibility of managing Narragansett Bay, says Kevin Cute, marine resources specialist and marine aquatic invasive species (AIS) guru at the R.I. Coastal Resources Management Council (CRMC). Cute recently spoke to and instructed members of the public on the art of monitoring for these marine invaders at a recent Coastweeks event. “This belongs to all of you,” he said of the waters. “I want you to be able to identify things, not just guess. You need to be sure it’s actually an invasive species.” As part of the annual Coastweeks celebration, a month-long series of events geared toward getting Rhode Islanders outside to learn about and celebrate the coast and sponsored by the CRMC and Rhode Island Sea Grant, Cute led a morning of hands-on monitoring on September 30 at Point Judith Marina in Wakefield. 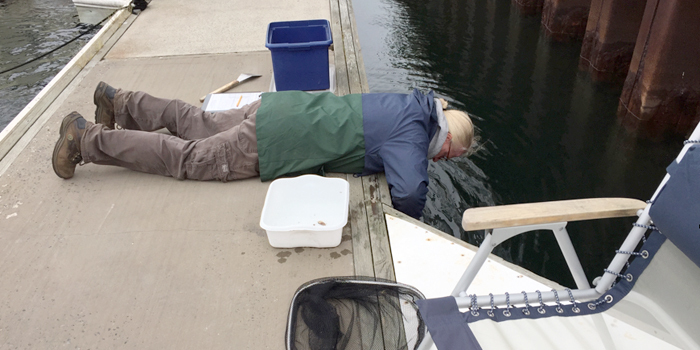 Cute peppered his morning monitoring session with demonstrations – taking water temperature, measuring salinity, using an old grilling spatula and an aquarium fish net to collect specimens from the underside of a dock – and factoids. One to note – salinity has a very strong effect on the success of some species, he said. Tunicates, for example, do best in higher salinity environments. “We collect random samples to get a true sense of the (invasive and native) community,” Cute said as he deposited his collected samples into a plastic basin filled with sea water. After instructing everyone to record their findings on prepared data sheets, Cute broke the attendees into groups of three or four, and sent them down one of the docks at the marina to repeat his process. 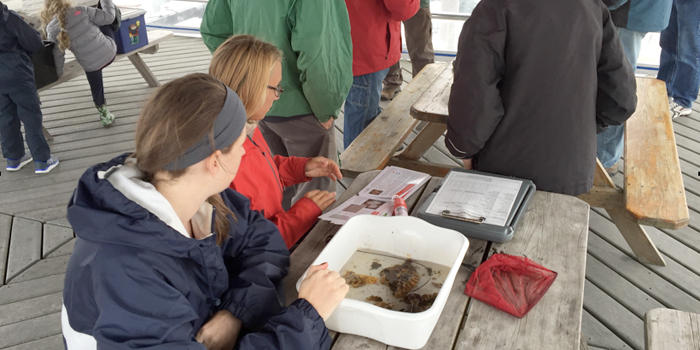 Once the teams had collected a good amount of specimens – native and non-native – Cute ushered the group up to the marina’s picnic area so that the classroom learning could continue. The CRMC has been monitoring for aquatic invasive species since the Rhode Island AIS Management Plan was approved in 2007 by the federal Aquatic Nuisance Species Task Force. The plan supports long-term monitoring for AIS in the state’s marine ecosystems and provides for actions to prevent the introduction of AIS, control their impacts, and eradicate those already present whenever possible. The plan encourages an Early Detection Rapid Response (EDRR) network that includes monitoring and an organizational framework to provide resources to minimize impacts of invasives. Cute and his volunteer monitors visit sites all over the state, and record their findings as part of this effort. How do they get here? According to Cute, ballast water from commercial shipping, as well as recreational boaters, are primary vectors (though there has been no definitive research into the impacts of recreational boaters). A non-native species must satisfy at least one of three requirements to be considered a marine aquatic invasive species: 1) it must cause environmental harm; 2) it must cause economic harm; and 3) it must cause harm to human health.